(September 30): More East Malaysians are signing a petition calling for Sabah and Sarawak to leave Malaysia despite the threat of being charged with sedition, a prominent Sabah politician told a forum last night. Datuk Jeffrey Kitingan said the petition to the United Nations, that could pave the way for a hearing on whether Sabah and Sarawak have the right to self-determination, has so far gathered 20,000 signatures. This is even while the police have launched investigations into another group who has an online petition on whether Sabah and Sarawak should leave Malaysia. Kitingan said instead of causing fear, the police investigation over calls for secession has sparked more interest among ordinary Sabahans and Sarawakians. “The situation is not like 20 years ago. You can see this on the Internet and social media. “Young people are not afraid of being arrested because they believe something must be done. “Instead of trying to create fear, Putrajaya should be listening to them and figuring out why they are unhappy and dissatisfied,” said Kitingan, who is president of Sabah opposition party STAR (Sabah State Reform Party). He was speaking to reporters after a forum, “Revisiting the Malaysia Agreement 1963”, organised by the Negara-Ku people's movement in Kuala Lumpur, last night. Others who spoked at the forum were Institute of Malaysian and International Studies (Ikmas) research fellow Dr Helen Ting and former Malaysian Human Rights Commissioner Tan Sri Simon Sipaun. Although talk of secession is considered treasonous, the past few years have seen a rise in nationalist sentiments among East Malaysians of all ages, speaking out against Putrajaya's treatment on Sabah and Sarawak. One online movement demanding for a review of the 1963 Malaysia Agreement which gave birth to the Federation is the Sabah Sarawak Leave Malaysia Facebook group or SSKM. On September 3, Sabah police said they have started joint investigations against the group under the Sedition Act 1948, with the Malaysian Communications and Multimedia Commission (MCMC). The group has been accused of inciting racial friction and attempting to disrupt public order. Kitingan, however, defended the group, saying that it was only conducting an online petition. The group’s website states that its purpose is to campaign for greater self-government for Sarawak and Sabah. Kitingan is also leading a separate but similar campaign through the Borneo Heritage Trust and Sarawak Association for People’s Aspiration, to collect signatures for a petition to the United Nations. If successful, it could lead to recommendations that Sabah and Sarawak be allowed to decide on their future in Malaysia. “A lot of people are signing on despite the climate of fear. The sedition investigation has accelerated interest in our cause," Kitingan said of the petition, which has so far gathered 20,000 signatures and aims to collect 300,000. A straw poll by The Malaysian Insider in July showed that feeling of secession was high among Sarawakians, while Sabahans generally wanted more autonomy on how they should be governed. The anger stems from Putrajaya not fulfilling the terms of the Malaysia Agreement in 1963, which brought Malaya, Singapore, Sabah and Sarawak to form the Federation. Among their grouses is that Putrajaya does not allocate a fair amount of development funds for Sabah and Sarawak even while almost all of its petroleum profits flow to the federal government. Under the agreement, Sabah and Sarawak were supposed to get more autonomy on its finances, education, civil service and religious affairs. In Sabah, locals are especially angry with what they perceive are attempts by Umno to change the state's demographics by giving out identity cards to Muslims from the Philippines and Indonesia. Kitingan proposed that Putrajaya consider drafting a new Malaysia Agreement giving more rights to Sabah and Sarawak to govern their affairs. Sipaun, however, was optimistic that things could still change for the better and that a solution could be found to the problems and unhappiness faced by East Malaysians. “My position is that if we separate, we will be flying into the fire. 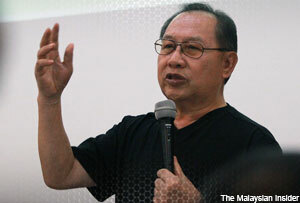 Already there are too many illegals in Sabah and there is no provision for secession.," he told the forum last night. Ikmas's Ting argued that Putrajaya nurtured Sabahan and Sarawakian leaders who suppress any talk of autonomy by locals. “There are clear instances of the federal government supporting state leaders against other leaders who are seen as rebellious," she said. "This creates an environment where foreigners are allowed in and given instant citizenship despite protests from residents. “There are villagers in the interior of Sabah where people don’t have ICs and yet you have all these foreigners walking around with Malaysian citizenship."